This Caramel Apple Kit has everything you need to make perfectly dipped caramel apples. The caramel is made out of 100% fresh local goat's milk and is seasoned with cinnamon sticks for the perfect fall flavor. The entire kit is Made in the USA and comes gift-ready for any fall-loving friend or family member. Fat Toad Farm is a family-run goat dairy in Brookfield, Vermont. It was started as a raise-your-own-food effort, but when the herd grew from 2 to 12 to 25 and started producing much more milk than one family could drink, Fat Toad Farm became a certified goat dairy. Today the family—Steve Reid, Judith Irving, Calley Hastings, and Josey Hastings—fills various roles on the farm and in the production room. 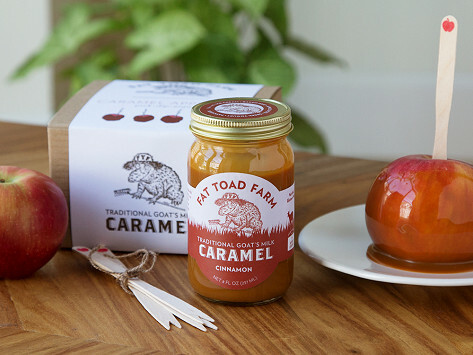 It’s Fat Toad’s somewhat unusual goat milk caramel that caught our eye. Josey has lived in Mexico on and off for the past decade, and there she discovered cajeta, a popular caramel sauce made from goat’s milk. She insisted the family try their hands at making it, and five years and four flavors later, customers can’t get enough of this delectable treat. We’re thinking ice cream right about now. Like dulce la leche (a traditional caramel sauce made with cow’s milk), all of the Fat Toad caramel sauces start with milk and sugar. But here, of course, the milk is from goats and the sugar is organic. Choose the original flavor (simply milk and sugar), or go for coffee bean, vanilla bean, or cinnamon for an extra flavor kick. The creamy, sweet sauce tastes familiar at first, but the finish is lent a buttery complexity unlike anything we’ve ever had. The two-jar boxed set comes in a unique wooden box and is perfect for gift-giving, but we wouldn’t blame you one bit if you wanted to keep the deliciousness for yourself.